Our aim is to provide you with a superb standard of accommodation, delicious fresh food and drink and, of course, the warmest of welcomes. Nestled in beautiful countryside, just outside the historic, medieval, market town of Devizes, we are ideally located for all of the many attractions of Wiltshire as well as Bath and Bristol. 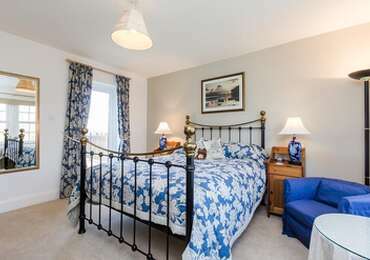 With four stylish rooms, all en-suite, three with south facing balconies, fabulous food and plenty of picture opportunities and tons of day trip options it's the perfect place to stay. We probably don't need to mention our free Wi-Fi, LCD televisions in every room, fully stocked fridges and overflowing hospitality trays or that we have some of the most comfortable beds you'll enjoy sleeping in. The only thing we care about is you. Arrive to a warm, friendly welcome, enjoy a drink and home-made cake or biscuits, sit outside and soak up the warmth of the sun or curl up on squashy sofas. Your room is individually styled, the bed will ensure the best night's sleep and breakfast will set you up for the day. Come and enjoy the glorious countryside and countless places of interest to visit. The next few pages reveal what we and the area have to offer and why you, like so many other guests, may be tempted to return time and again. Our ethos is simple;whatever the reason or for however long you are staying, our aim is to make our home your home. Our motto:We remember you always have a choice! 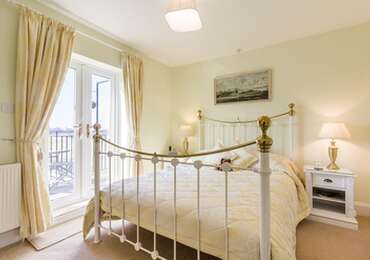 Sleep in Serenity, the sunshine room with beautiful views across the countryside through balcony doors. With south westerly views you can sit on your balcony, furnished with a bistro table and chairs, with a glass of wine and watch the sun go down! The room is furnished with a lovely, comfortable, king sized, brass bed dressed with Egyptian cotton sheets and quality Dorma bedding. There are all the items you'd expect in a superior room including a silent fridge containing fresh milk, chilled water plus other treats and extensive hospitality tray with large selection of tea, coffee, herbal teas and chocolate drinks. The good sized en-suite bathroom has a powerful shower, lots of hot water, LED mirror with shaver/toothbrush point, cosy dressing gowns, fluffy bath towels and lots of extras. 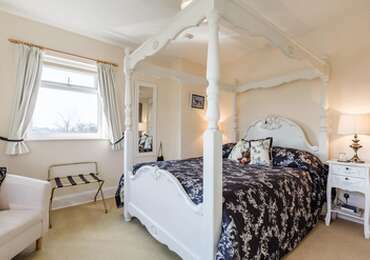 A beautiful light room with a four poster canopy bed and dual aspect with views both across the fields and the orchard and a large balcony for soaking up the warmth of the sun, this is a room for romantics. This bedroom is furnished with a lovely, comfortable, king sized, four poster bed dressed with Egyptian cotton sheets and quality Dorma bedding. There are all the items you'd expect in a superior room including a silent fridge containing fresh milk, chilled water plus other treats and extensive hospitality tray with large selection of tea, coffee, herbal teas and chocolate drinks. Our second largest room with dual aspect views overlooking the hills on one side and our garden with donkeys and open countryside on the other. Enjoy the large balcony with south westerly views, furnished with a bistro table and chairs, with a glass of wine and watch the sun go down! The room is furnished with a lovely, comfortable, king sized, brass bed dressed with Egyptian cotton sheets and quality Dorma bedding. There are all the items you'd expect in a superior room including a fridge containing fresh milk, chilled water plus other treats and extensive hospitality tray with large selection of tea, coffee, herbal teas and chocolate drinks. A fabulous new bathroom with a powerful shower and room for two, lots of hot water, cosy dressing gowns and fluffy bath towels caps this off.